An undergraduate researcher has developed a method to screen frogs for an infectious disease that has been linked to mass die-offs of frogs around the world. Thanks to her method, scientists will be able to track the disease and try to figure out why it is triggering the deaths. Emily Karwacki, who recently earned her biology degree from the University of Central Florida, didn't set out to track the deadly pathogen Perkinsea, but after landing a research spot in Assistant Professor Anna Savage's lab, she was set with the task of trying to test for the disease. Frogs, which are indicators of environmental changes, have been dying off in mass quantities. They are also an important part of the food chain. Without frogs, many other species would die, Savage said. Scientists have narrowed down what's most affecting frogs to three pathogens, including Perkinsea. "Not a lot of people have studied Perkinsea because it has only recently been identified," Karwacki said. "It's different from other diseases because of the way it attacks the host." The pathogen enters the frog through the skin or may be ingested through its mouth. Scientists know it goes straight to the liver, embedding itself, before moving onto the rest of the tissue. It spreads and then the frog dies. Karwacki, along with Savage and doctoral student Matt Atkinson, suspected that Perkinsea was killing frogs in Central Florida, but the researchers needed a way to test for it first. Karwacki was tasked with creating the molecular test. The method is called qPCR, but because Perkinsea was newly discovered, there wasn't enough genetic data to make a specific test. Karwacki had to create what's called a primer pair, and match it with a DNA sequence of Perkinsea, to get the qPCR test to work. "The test amplifies the DNA so you know if your pathogen is there or not," Emily said. "I had to align a bunch of DNA sequences from our samples with others from around the word to create my primer set. It was four or five months before we had both the primers and the probe to create a successful test." Karwacki was the first to do this for Perkinsea and her work was recently published in the journal Diseases of Aquatic Organisms. Using Karwacki's qPCR assay, the team of researchers found that 25 percent of the frogs they sampled tested positive for the pathogen. They sampled three sites in Florida: Gold Head Branch State Park in Keystone Heights, the UCF Arboretum in Orlando, and the Archbold Biological Station in Venus. The area they found with the most prevalent infection was Gold Head Branch, which is the farthest north. Archbold, the farthest south, had no infection at all. "There are only three papers on this disease that identify it specifically," Karwacki said. 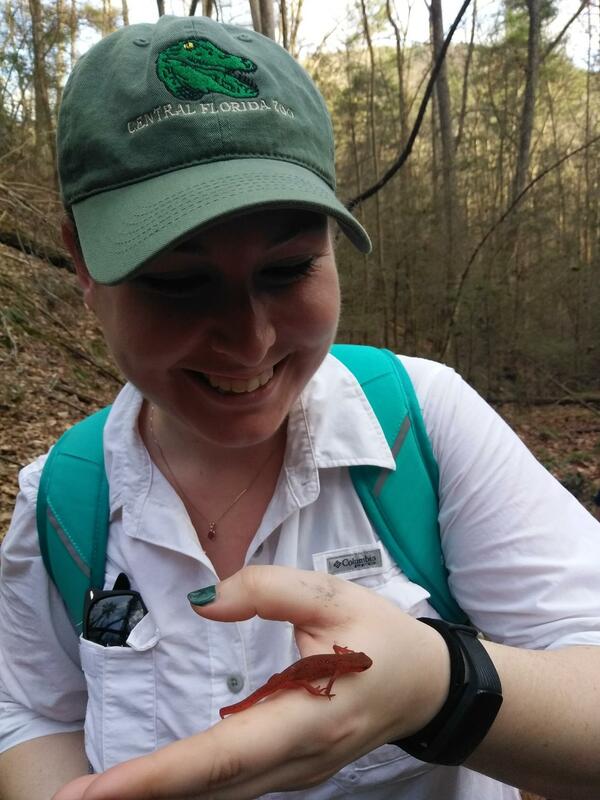 "It has greatly been affecting amphibians in the southeastern United States and should be studied more. It's most likely at least a co-factor in these extinction events we are seeing." Karwacki's method will now allow researchers all over the world to test for the disease. After graduating this summer, she is working on a new study, swabbing frog tissue samples at the Florida Museum of Natural History in Gainesville. She's swabbed more than 900 samples, and has found that Perkinsea dates back to 1922. This proves the disease has been in frog populations before, and scientists are trying to figure out why it's only now killing off large numbers of frogs. "Now with my qPCR, people can test areas where they are trying to release frogs to rebound populations," Karwacki said. "Scientists can test water and soil to see if Perkinsea is there so we don't send frogs out to die." Karwacki is entering the nonprofit business management master's program at UCF before pursuing graduate school. She will continue her work as a research associate in Savage's lab.